ABU DHABI, 28th February, 2018 — Prime Minister of the Federal Republic of Somalia, Hassan Ali Khayre, has visited Abu Dhabi’s Wahat Al Karama, the national landmark built to immortalise the sacrifices of the UAE’s brave heroes. Khayre was received by Sheikh Khalifa bin Tahnoun bin Mohammed Al Nahyan, Director of The Martyrs’ Families’ Affairs Office at the Abu Dhabi Crown Prince Court. 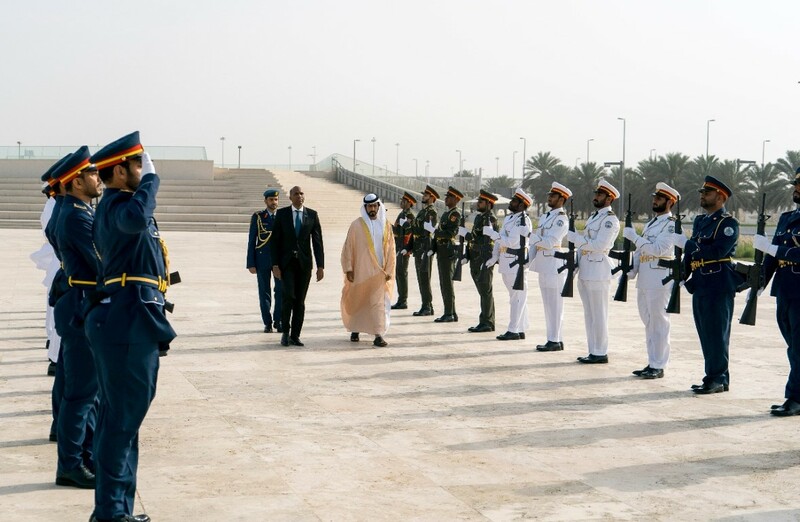 The visit began with the Honor Guard performing a ceremony, after which the Somali Prime Minister laid a wreath before the Memorial, the monument made up of 31 massive aluminum panels leaning on one another to symbolise solidarity between the people, the leadership of the UAE and the brave soldiers. Accompanied by Sheikh Khalifa bin Tahnoun, the Prime Minister of Somalia toured the site’s prominent areas. He concluded his visit by signing the visitors’ log and lauded the UAE’s heroes for their noble sacrifices and inspiring bravery in the face of adversity.